Derek Fisher came to say his final farewell to Los Angeles by doing the only thing we know how..PARTY! He talks about his future with Phil Jackson and the New York Knicks. Derek Fisher profile updated daily. 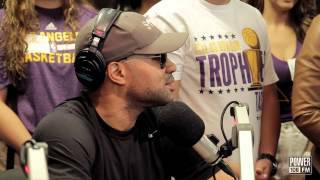 ... Derek Lamar Fisher Height ... Derek Fisher Says Final Farewell to Los Angeles (Extended) Comments. James Lipton Asks Robin Williams "If Heaven exists..."
Is DJ Mustard Tired of Hearing "Mustard On The Beat" During His Songs?